Home | Serigraphs and Giclee Fine Art | Kerry Hallam | Kerry Hallam Handsigned & Numbered Limited Edition Serigraph:"Cinqueterre "
Kerry Hallam Handsigned & Numbered Limited Edition Serigraph:"Cinqueterre "
Image size: 32 1/4" x 27 "
About the Artist:Kerry Hallam is as refreshing and spirited as his paintings. He creates enticing images through bold palettes and captivating compositions. Enthusiasm for his art is fully evident in Kerry Hallam's vivid, windswept seascapes and timeless, sun-dappled village scenes. Strongly inspired by the Fauves, Hallam has a strong affinity for the 19th century French Post-Impressionists. 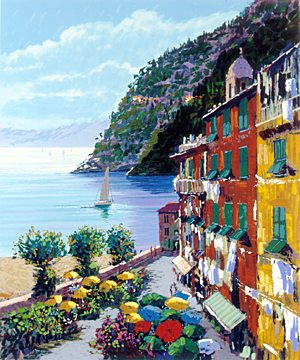 Home | Fine Art Prints & Limited Editions | Gallery Direct Art is your Authorized Chalk & Vermilion Dealer | Kerry Hallam | Kerry Hallam Handsigned & Numbered Limited Edition Serigraph:"Cinqueterre "